In my previous post I wrote about sleep. So I think it makes sense that this blog is about the things a dog does during her waking hours. Like last week, I am reaching out to some good ol’ wisdom “All work and no play makes Jack a dull boy”. Well, frankly all play and no work does not, in most cases, do Jack too much good either. When it comes to our Fido, it’s pretty much the same. So is there a concept of “work” for dogs. Well…I am not talking about finding an income source using our dogs. I am talking about the dog using her brain. And yes, dogs are remarkably smart animals who can think and use their brain. We know that just as we need to use our muscles to build them out, we need to use our brains to have it working at optimal levels. This is the same for dogs as well. Using those grey cells not only keeps them sharp and fast, but research is revealing that it also helps create new cells that replace damaged cells or help other cells compensate for work of damaged cells. When I was getting my dog trainer education in Norway, I had the good fortune of sitting in on a very interesting project called The Pulse Project. This project measured the pulse of a dog as the dog went through several different activities. It was very fascinating to see how some activities shot up a dogs pulse while some kept it stable and some others actually lowered it. Brain work stood out as the champion of activities that helped lower a dogs pulse and calm a dog. Most urban dogs in general have elevated heart rates due to stress. Brain work is the answer for most of our dogs. A dog can’t do Sudoku. But we can give him some interesting puzzles where he uses his strengths – his nose, his ears and his mind. The simplest of these would be treat search. Just break up chicken or paneer or egg into tiny bits and scatter them all over the floor. Say nothing. I guarantee you that your dog will soon catch on and start sniffing out all the goodies. As the dog gets better at it, the goodies can be hidden under toys, on top of chairs and other obscure places. A variation of this that I love is asking them to stay in a room and then hiding the treats and letting them out. The first time Nishi and Tigger cried. But they soon caught on and waited eagerly, listening intently to what was happening on the other side. This got them to use their ears as well. Another puzzle where they can use their brain is to crumple a full sheet of newspaper, hide some treats in the folds and give it to the dog. Oh they love it. Chews Dynamite is far more fun than just a chew! Check out the Chew stick lying abandoned on the side while all attention is focused on the Puzzle! The possibilities of such games are endless. It’s mental stimulation for both you and your dog and provides for some great bonding opportunities. While the act of finding solutions calms dogs, actually solving it brings them such joy! As the dog gets better at problem solving the dog gains confidence in himself and his ability to problem solve and cope with life. Life throws curve balls at all of us. Our dogs are no exceptions. They too are asked to deal with things every once in a while. And only they can help themselves. A helpless dog is our fault. “Learnt helplessness” is often an outcome of poor parenting. This is true of humans. It’s true of dogs as well. Physical exercise too influences the brain. Depending on type of exercise, duration and the nature in which it’s done, it can provide oxygen and glucose to the brain cells to replenish and add mental stimulation as well. Not to mention the physical benefits of such exercise on both dog and human. On of the best forms of physical exercise is a 40 min to an hour long relaxed walk. It could be a single walk or split over a few different times a day. Walks provide access to an enriched environment and it’s a great way to expose a dog to so many sights, sounds and smells. A dog will often have her curiosity piqued with all these small details and will explore everything around. Exploring, understanding and assimilating teaches dogs coping strategies and stimulates so many senses. The best way to walk is to give the dog as much time as she wants to explore these wonders of the “outside world”, in a safe way and then politely ask her to follow you after she is done with her exploration. A relaxed walk with loads of opportunity to explore is not only a fantastic learning opportunity for dogs, but also a great way to relax and bond with our dogs. Not all forms of play are great for dogs and more is not always better when it comes to walks with dogs. Runs are not as beneficial as walks either. Runs not only deprive the dog of the opportunity to explore and learn, but also end up directing the oxygen and glucose towards the muscles, rather than the brain. 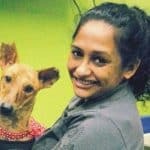 As we lead up to Diwali, I’ll write more about stress and in there I’ll cover the topic of games that are in fact stressful for dogs and are best avoided. I love walks. But I personally enjoy brainwork a lot more. I never help them solve it and always give them time to figure it out. If it gets too hard, I simplify the puzzle or increase motivation to solve it by providing better treats. But I never help. As my teacher repeats over and over to us – helping leads to…..”Learned Helplessness”. And nothing feels as good as actually “cracking it”. I ask the girls “who wants to solve puzzles” and they both come to me looking very eager and sit next to me, full of curiosity at what I am putting together. I am always looking for new ways to challenge their brain. New ideas excite me a lot. Do you play puzzles with your dogs? What are some cool puzzles that your dogs love? Do share your ideas. And if you have not tried puzzles with dogs, do it. It’s so much fun! Another fun puzzle for dogs.